Meet Santiago Seseña Rodriguez, a longtime hospitalero whose lifetime dream of an albergue of his own finally came true in 2018. Santi runs the Albergue de Peregrinos de Izarra, a 20-bed private operation on the Camino del Norte, just east of Comillas. Santi´s a Madrid native who for years worked alongside Jose Luis, the charismatic hospitalero at Albergue San Francisco Asis in Tosantos. Like his mentor, Santi is a talented host and a quietly spiritual guy. 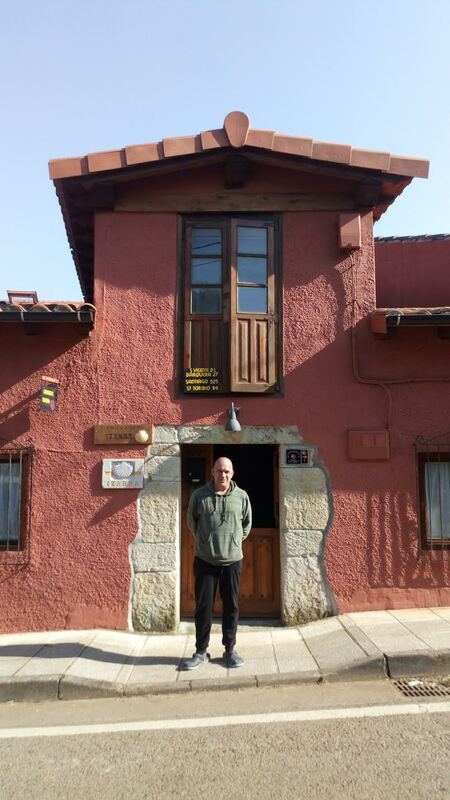 The Izarra albergue was founded in 2016 by Alex, a former taxi driver turned Camino apostle. He started Albergue Bodenaya, still a landmark of generosity on the Camino Primitivo, as well as a couple of other non-profit pilgrim establishments. If you visit Izarra, you may meet Alex -- he still serves as a volunteer hospitalero there sometimes. I met Santi a year ago, when Peaceable Projects installed new picnic benches and tables in the garden outside the Tosantos albergue. When I heard that Santi had taken charge at the Izarra albergue, and that he was freezing this winter in its un-heated garret, I got in touch. He´d heard about the pellet stoves at Santa Cruz in Sahagun, he said. He didn´t know a privately owned albergue qualified for Peaceable funds. Public, private, or parochial – it´s the donativo spirit that makes the difference! Can a pilgrim stay there if he has no money? Is there a genuine need for the prospective project? If the answer is a proven “yes,” then sure! Peaceable donors are here to help! Canadians know about cold, and about keeping warm. They are fabulously generous, and they know how to move fast. It was a perfect match. Soon as Santi found the right builder and had a figure in hand, I touched the Canadians for a cool 3,000 euros. The British Colombia branch gave 1500 euros, and the national group gave 1,500 euros. Beauty! The money arrived today. The installation works will begin after Holy Week. I never even had to pass the hat! Big thanks to Canada. And for supporters who are not from there, we´ve used funds from our past fundraisers and our monthly donors this winter to buy a washing machine and vacuum cleaner for a pilgrim shelter in the mountains of Leon, some downspouts for a little place on the San Salvador, and maintenance supplies for the Pilgrim Memorial Grove. More projects, big and small, are afoot. Thanks to YOU, the Camino keeps chugging along. Older PostWe Buy the Beds and Make the News!